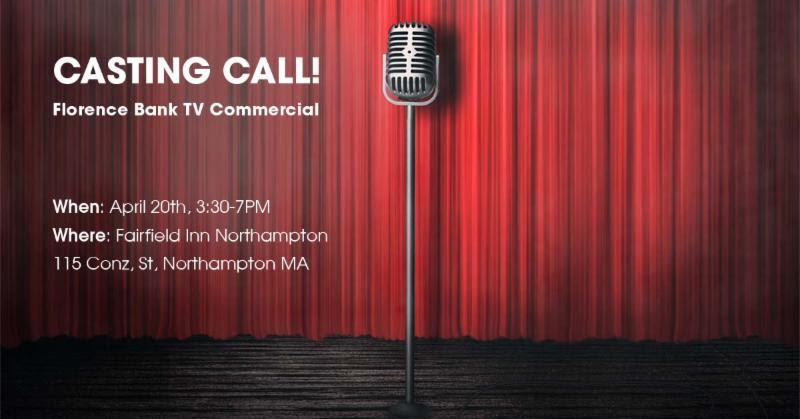 Florence Bank TV Commercial Casting Call! 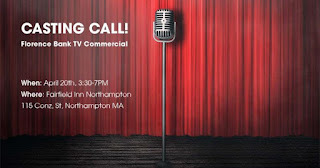 We're looking for local talent to participate in our next Florence Bank TV Commercial! This year, no musical or performance experience is needed. However, we are looking for folks who are willing to have FUN on camera and sing a little tune-you don't have to sound like Adele! We're looking for real local people. We want to show off small businesses and people who are involved in the community. So whether you're a restaurant worker, bus driver, volunteer baseball coach, nurse, or a teacher, as long as you want to have fun and sing, we want you to audition. If selected, all talent will be compensated $250 for 2-3hrs on set (must be available May 24 or 25). include headshot/reel (optional), contact information, and preferred time.